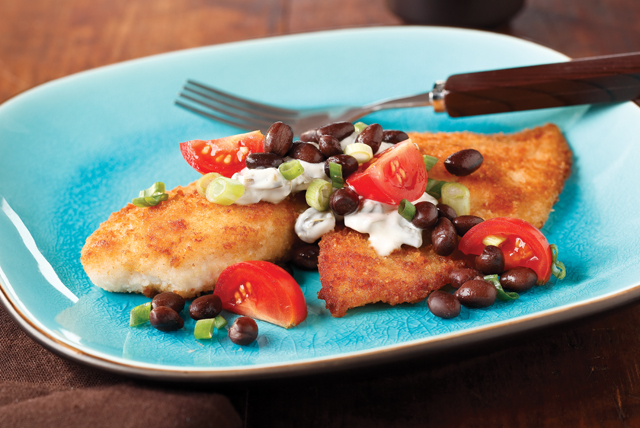 Enjoy this Breaded Tilapia with Black Bean Salsa. The breaded tilapia adds a kick with a jalapeno-mayo sauce and crunch with a buttery cracker breading. Place cracker crumbs in pie plate. Brush fish with 3 Tbsp. mayo. Dip fish in crumbs, turning to evenly coat both sides of each fillet. Mix remaining mayo and jalapeños. Heat 2 Tbsp. oil in large skillet on medium-high heat. Add fish, in batches; cook 3 min. on each side or until fish is golden brown on both sides and flakes easily with fork. Remove from skillet; cover to keep warm. Meanwhile, combine remaining oil with remaining ingredients. Top fish with mayo mixture. Serve with bean mixture. Prepare using RITZ Crackers with Whole Wheat and KRAFT Light Mayo Reduced Fat Mayonnaise.